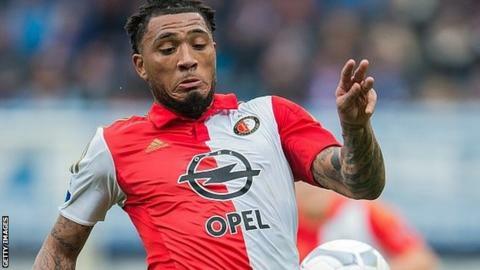 Celtic have signed striker Colin Kazim-Richards from Dutch side Feyenoord on a two-and-a-half year deal. The 29-year-old Turkey international is a replacement for Nadir Ciftci, who has been loaned out to Eskisehirspor until the end of the season. Celtic earlier confirmed the signing of Manchester City winger Patrick Roberts on an 18-month loan deal. The 18-year-old, who has played for England Under-19s, joined City in the summer from Fulham. Kazim-Richards has scored over 50 goals in more than 350 club appearances across spells in England, Turkey, France, Greece and the Netherlands. The London-born forward, who played for Bury, Brighton and Sheffield United early in his career before heading abroad, said he felt "privileged, thankful and ecstatic" after accepting Celtic's offer. "To tell you the truth, I never wanted to come back to Britain," he said. "But once this opportunity came, it was an obvious decision. "I have played at big clubs but this is one of the biggest. The fans can expect someone who will give 125% every day, not just on match-day. I'm really honoured to have this opportunity to come and show my abilities." Roberts, meanwhile, is looking forward to some first-team action after being restricted to three appearances as a substitute for City this season. "Manchester City know I need to be playing football and they were happy for me to come up here," said Roberts, who was sold to City for around £12m. "Celtic are huge in Scotland and huge in Europe and this is what I want. I'm here for a long time and I want to develop. I want to do well for Celtic, win trophies and get into Europe. "I'm very direct and quick. I like to get the fans off their seats, which I hope to do many times, and I like to score goals." Ciftci, 23, joined the Scottish champions from Dundee United on a four-year deal in July but has found it hard to break into Ronny Deila's first team. The Turkish striker will stay with Süper Lig side Eskisehirspor in his native country until the end of the current campaign. Deila has already signed Denmark defender Erik Sviatchenko, who featured in Celtic's Scottish League Cup semi-final defeat by Ross County on Sunday. Meanwhile, Celtic have sent teenage forward Aidan Nesbitt on loan to Premiership rivals Partick Thistle for the rest of the season.